Now I admit that last post was on the silly side. I am still kind of embarrassed about it. The Latin itself would probably best be described as some kind of Latin doggerel. You will be relieved to know that I did dash it off rather quickly. So no one can accuse me of a too gross neglect of time in composing such a ludicrous work. The chief reason for learning Latin does not consist in learning Latin. It does not consist in learning to speak Latin or read Latin or write Latin. All of those things are secondary to the chief reason. And what, you ask, is the chief reason for learning Latin? Or more universally, the chief reason for learning Latin is that through it we learn the liberal art of grammar; through the study of Latin we learn language itself! Now that is a provocative statement isn’t it? Why, obviously to learn Spanish, you dolt! El burro sabe mas que tu! And similarly suppose one were attempting to learn Chinese. Would we not expect that such a one was learning Chinese in order to read Chinese? Why else would one learn Chinese with all those intriguing and mysterious characters? The conventional measure of whether language study has been fruitful and profitable is the extent to which the student is able to speak, read and write the language he is studying. Now, what do we mean when we say that the purpose of learning Latin is not really to learn Latin, but is rather to learn English? I mean quite simply this. The study of Latin has the unique capability of revealing what language itself (or Language qua language, or if you like language as such) is to anyone who spends even the smallest amount of time studying it. Latin is, for all intents and purposes, the embodiment of language in its formal aspects. That is to say, that Grammar, which is more or less hidden in this language or that language, is something delightfully manifest and accessible to the student in Latin. The Grammar and principle of language inherent in every language are marvelously manifest in Latin. Latin is such an effective vehicle for learning Grammar that one is almost inclined to think that the language itself is nothing other than a grammar manifesto; the culminating document achieved by the first Grammar Convention back around 700 B.C. Every Language has something in common, namely some manner of predicating. Every language is called a language because each involves a specific manner of saying some thing about something; each involves its own mode of making statements or asking questions; each involves its own way of asserting this or denying that. In every language, however primitive, there must needs be nouns and verbs and adjectives. There might even be pronouns and conjunctions and adverbs as well! But what these various parts of speech are might in fact be quite mysterious in this or that language. The fact that a verb has time and voice and mood and number may or may not be clear in this or that language. The fact that a noun may have gender and case may be unclear in some specific language. What is a noun? What is a verb? What is an adjective? And don’t tell me that “a noun is a person place or thing” either! We have already spoken about this embarrassing confusion elsewhere. And is Grammar really necessary? Does a precise and refined knowledge of Grammar aid us in any other important endeavor? Or is it only an art that is helpful for those who would like to conduct themselves courteously? ; is it only an art that might help one to avoid committing an embarrassing verbal faux pas at tea a party? Just as that great general and master of armies and strategy, Julius Caesar, knew how to organize and martial his forces in such a coordinated and ordered manner that he was able to conquer all of Gaul, Greece and Egypt, so too is one, who has learned to martial his words through the art of grammar, able to be an effective thinker. 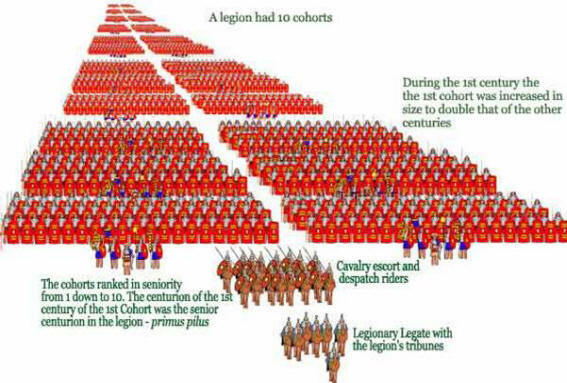 Just think of all those Latin paradigms as so many phalanxes and cohorts. Words ready for battle. Words arranged for effective thought and communication! When a student memorizes all those Latin paradigmns he becomes a veritable linguistic general. He becomes a Martial of effective speech! No other language is capable of making a student a master of language and of grammar so effectively. No other language is so accessible to the ordinary student! This entry was posted in classical education, Grammar, Latin, Liberal Arts and tagged grammar, Julius Caesar, Latin. Bookmark the permalink. This is the worst possible defense of Latin study – accompanied by the worst possible linguistic rationale – preceded by horrific Latin. Was this for an Onion piece? The problem: Latin is, in fact, quite different from most languages – especially in regard to its grammar! That’s why I’d say that your raison d’etudier le latin is pitiful. It’s so different from Greek, yet those with Latin brains decided to apply its rules and names to Greek. Big mistake, as the current misconceptions of “Middle” or “Deponent” Verbs shows clearly. It shares some cases with German and thus students of historical German try to apply Latin case names and even Latin verbal names to German. Fail! Ditto for Hebrew and English, two languages that could hardly be more different from Latin. Cheers, though, or prosit tibi. Thanks Jonathan! There’s nothing so refreshing as such a robust critique. I just re-read my Latin, and although I did apologize for it at the beginning of this post- I don’t think it was “horrific”- I mean… I think it might be “bad” or “stilted” or “awkward” but to call it horrific seems a little over the top to me! But are you not ready to admit that every language shares in something which is identical …namely “grammar”. Isn’t there something the same in every language despite the idiosyncrasies that belongs to each? Isn’t there a universal art of Grammar? Is it possible that one language exemplifies this ‘universal art’ more so than all the others? I apologize if I was too tough on your Latin; “horrible” is a strong word, indeed. Of course, it is *possible* that one language should exemplify the ‘universal art’ of grammar more so than all others – but in my informed opinion, it would “exemplary” to its linguistic sub-set, e.g., Indo-European, Semitic, et al. I don’t know enough about Chinese to know how it fits into the mix, honestly. To call grammar a universal art is to speak too univocally about an equivocal term: you’re certainly not referring to the tradition of techne grammatike as that phrase was used by the great Greek grammarians; much less in the similar manner of Quintilian, for whom “grammatica” was – contrary to your claim – the study of great literature, more than the study of grammatical rules. Yes, those rules inform the great literature – but those same rules are not infrequently “broken” by the greatest writers! In measure, granted. My greater concern is about your imputation of the cause for studying Latin: if it is not “for its own sake”, then why? You offer some responses to that dubium, but they’re not convincing, IMHO. One’s time would be better spent on German or French grammar if one intended to learn *English* grammar through a foreign language. German assimilates Latin – albeit to a lesser extent than we do in English – and French is the tool of transmission for most of our Latin. I think the Popes’ defenses of Latin study are more reasonable: you study Latin so that you may know Latin. Period. That is also the most liberating reason to study such a subject. Latin is not the tool. The tool (modern grammatical analysis) is only a tool because its analytical method MUST be balanced with the synthetic method of…reading, writing, listening, and speaking. Reading first, however, because it is that meditative and reflective act whereby we, in St. John XXIII’s words, mine some of the most brilliant and penetrating words ever penned. Finally, this excursus on a Greek primer sheds helpful light on how inept Latin grammar is (much less Greek grammar) for teaching *English* grammar. Thanks again Jonathan, I thought I had replied to your last message but realize I did not as of yet. You will be delighted, I hope, to know that I have read aloud your thoughts to my own Latin class. They are enjoying the argument. IN the mean time is there any chance that you could point me to the pages in the excurus to which you are referring. I have signed up for my jstor account and have downloaded the text. Thanks!